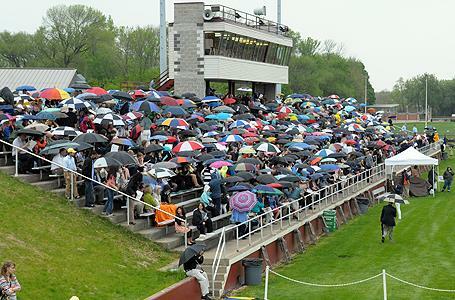 It was 30 minutes before Hope College’s Commencement on Sunday, May 6, was scheduled to begin at Holland Municipal Stadium. Family and friends were in the stands, the graduates were lining up and making ready to process to the strains of “Pomp and Circumstance,” and… the skies rumbled. Change of plan. Hope postponed the 3 p.m. ceremony to 4 p.m., and moved the event a few blocks north to the DeVos Fieldhouse, the previously arranged rain location. Graduates, audience, diplomas, all were in place and ready to go in the new site just one hour later than originally scheduled, a tribute, President James Bultman noted as the ceremony began, to all involved. College records don’t indicate whether or not the ceremony has ever before been moved on the very cusp of beginning, but certainly it’s never happened that way in living memory. Most years, whether or not to move inside is obvious early in the day, and the announcement is made during the morning’s Baccalaureate services. If at all possible, Hope holds the ceremony outside because the stadium can accommodate a larger audience than the fieldhouse, and so the college had taken a chance that the morning’s cloudy skies wouldn’t lead to an afternoon storm. As it happened, the thunder and rainfall that prompted the change in venue didn’t last long—by 5 p.m. it was succeeded even by a bit of sun. The last time that the ceremony was held inside was in 2004, at Zeeland East High School in the pre-fieldhouse era. Approximately 690 graduating seniors participated in this year’s ceremony, the college’s 147th. The class consisted of students from throughout the United States as well as from overseas, including from Armenia, Brazil, China, Kyrgyzstan, Mexico, Palestine, Singapore, South Korea and Thailand. In addition to celebrating the Class of 2012, the college presented honorary degrees during the ceremony to Joel Bouwens and Martie Bultman. Bouwens, of Holland, chaired the college’s Board of Trustees from 2003 to 2011. Bultman, who didn’t know in advance that she was receiving the recognition, has been an active member of the campus community as the wife of President James Bultman. Also, the graduating class presented the 48th “Hope Outstanding Professor Educator” (H.O.P.E.) Award to Dr. Sonja Trent-Brown, associate professor of psychology. The award, first given in 1965, is presented to the professor the class feels epitomizes the best qualities of the Hope College educator. Each step offered a way to approach life with deeper meaning. Since being diagnosed in 2005 and subsequently revealing the condition, though, she has found others understanding and helpful. She also noted that she has learned from her students how to live with the condition by observing how they handle challenges of their own. She outlined ways that each of the three homework steps can support such authenticity. During the college’s Baccalaureate services in Dimnent Memorial Chapel earlier in the day, the Rev. Dr. Trygve Johnson, who is the Hinga-Boersma Dean of the Chapel at Hope, delivered the sermon “So… now what?” It was a natural question, he noted, at a time of transition such as graduation. He framed his discussion as a response to a “letter” to him from a dean of the chapel at the fictional “Despondent University” in the Pacific Northwest that asked him, if given the chance to speak during graduation, to ask the students to live for more than themselves. Johnson grounded his answer in Matthew 6:24-33, from the Sermon on the Mount, in which Jesus instructs not to be anxious about worldly concerns but instead to seek God’s kingdom and righteousness and to trust God to attend to the rest.